Your institution must subscribe to JoVE's Neuroscience section to access this content. This protocol describes the stabilization of the oxygen level in a small volume of recycled buffer and methodological aspects of recording activity-dependent synaptic plasticity in submerged acute hippocampal slices. Weng, W., Li, D., Peng, C., Behnisch, T. Recording Synaptic Plasticity in Acute Hippocampal Slices Maintained in a Small-volume Recycling-, Perfusion-, and Submersion-type Chamber System. J. Vis. Exp. (131), e55936, doi:10.3791/55936 (2018). Even though experiments on brain slices have been in use since 1951, problems remain that reduce the probability of achieving a stable and successful analysis of synaptic transmission modulation when performing field potential or intracellular recordings. This manuscript describes methodological aspects that might be helpful in improving experimental conditions for the maintenance of acute brain slices and for recording field excitatory postsynaptic potentials in a commercially available submersion chamber with an outflow-carbogenation unit. The outflow-carbogenation helps to stabilize the oxygen level in experiments that rely on the recycling of a small buffer reservoir to enhance the cost-efficiency of drug experiments. In addition, the manuscript presents representative experiments that examine the effects of different carbogenation modes and stimulation paradigms on the activity-dependent synaptic plasticity of synaptic transmission. In 1951, the first-reported acute brain slice experiments were conducted1. In 1971, after successful in vitro recordings from the piriform cortex2,3 and the discovery that hippocampal neurons are interconnected transversely along the septotemporal axis of the hippocampus4, one of the first in vitro recordings of hippocampal neuronal activity was achieved5. The similarity of the neurophysiological or neurostructural parameters of neurons under in vivo and in vitro conditions are still the subject of some debate6, but in 1975, Schwartzkroin7 indicated that the basal properties of neurons are maintained in vitro and that high-frequency stimulation (i.e., tetanization) of afferents in the hippocampal formation induces a long-lasting facilitation of synaptic potentials8. Electrophysiological recording of neuronal activity in vitro greatly expanded the study of the cellular mechanisms of activity-dependent synaptic plasticity9,10, which had been discovered in 1973 by Bliss et al.11 in in vivo experiments with rabbits. The study of neuronal activity or signaling pathways in brain slices, and especially in acute hippocampal slices, is now a standard tool. However, surprisingly, in vitro experiments have yet to be standardized, as evidenced by the multiple approaches that still exist for the preparation and maintenance of acute hippocampal slices. Reid et al. (1988)12 reviewed the methodological challenges for the maintenance of acute brain slices in different types of slice chambers and the choices of bathing medium, pH, temperature, and oxygen level. These parameters are still difficult to control in the recording chamber due to the custom-made elements of in vitro slice-recording setups. Publications can be found that might help to overcome some of the methodological challenges and that describe new types of submersion slice chambers, such as an interstitial 3D microperfusion system13, a chamber with enhanced laminar flow and oxygen supply14, a system with computerized temperature control15, and a multi-chamber recording system16. Since these chambers are not easy to build, most scientists rely on commercially available slice chambers. These chambers can be mounted on a microscope system, thus allowing for the combination of electrophysiology and fluorescence imaging17,18,19. Since these chambers keep the brain slices submerged in artificial cerebrospinal fluid (aCSF), a high flow rate of the buffer solution needs to be maintained, increasing the expense of drug application. 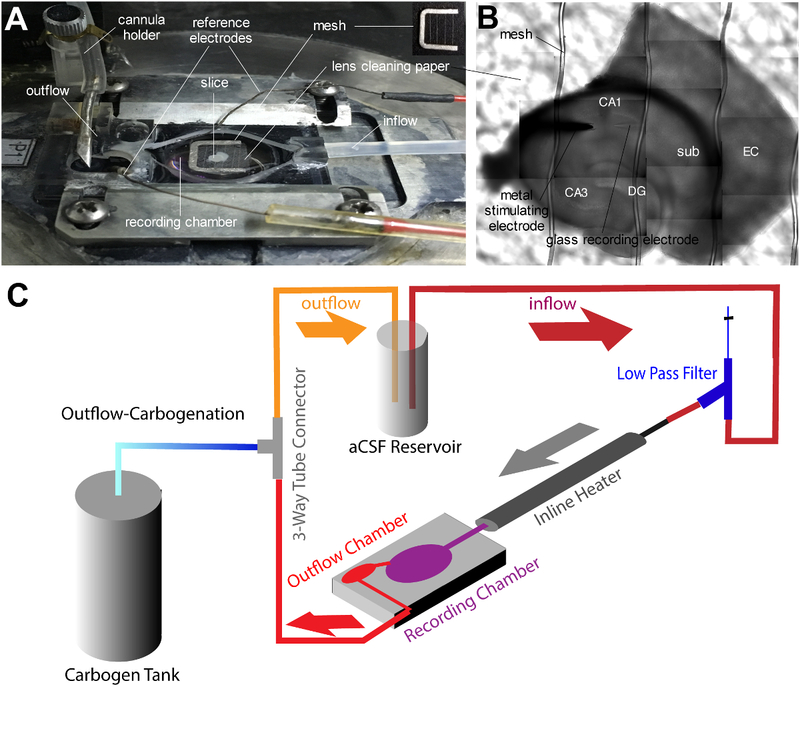 To this end, we have incorporated a recycling perfusion system with outflow-carbogenation that provides sufficient stability for the long-term recording of field potentials in a submersion slice chamber using a relatively small aCSF volume. In addition, we summarized how the use of this experimental carbogenation/perfusion system affects the outcome of activity-dependent synaptic plasticity10 and how inhibition of eukaryotic elongation factor-2 kinase (eEF2K) modulates synaptic transmission20. The animals were maintained in accordance with the established standards of animal care and procedures of the Institutes of Brain Science and State Key Laboratory of Medical Neurobiology of Fudan University, Shanghai, China. NOTE: See the Table of Materials. Prepare the slicing buffer (modified Gey's solution): 92 mM NaCl, 2.5 mM KCl, 1.25 mM NaH2PO4, 30 mM NaHCO3, 25 mM glucose, 20 mM HEPES, 3 mM Na+-pyruvate, 10 mM MgSO4, and 0.5 mM CaCl2. Adjust the pH to 7.6 using 1 M NaOH without carbogenation. Store the buffer at 4 °C. NOTE: The titration clarifies the cloudy liquid. The osmolality is 305-310 mOsm. The carbogen21 contains 5% carbon dioxide and 95% oxygen. Prepare the aCSF by diluting a 10x stock solution of aCSF that does not contain bicarbonate and glucose, giving a final composition of: 124 mM NaCl, 2.5 mM KCl, 2.5 mM CaCl2, 2 mM MgCl2, and 1.25 mM KH2PO4. Add bicarbonate and glucose to reach 10 mM glucose and 26 mM NaHCO3. Carbogenate the aCSF through a perforated silicon tube with a blocked end immediately after adding the NaHCO3. Measure the pH while carbogenating (pH 7.3-7.4). NOTE: The buffer capacity can be adjusted slightly by altering the amount of NaHCO3. Since the resulting pH is temperature-dependent, it is necessary to check the resulting pH while carbogenating at the working temperature (e.g., 30 °C). Place a slice-holding mesh into an incubation chamber for acute brain slices, fill the chamber with aCSF, and carbogenate (4-6 L/h) for at least 30 min22 at 28-30 °C. Cool the surgical instruments down to 2-4 °C. Place a glass beaker filled with cold and carbogenated slicing buffer (2-4 °C), maintained in an ice/water mixture, near the vibratome. Anesthetize rats or mice until the corneal reflexes disappear (30-50 s) using isoflurane by taking 500 µL into a 2 L glass jar or 12.5 µL into a 50 mL tube. Isolate the brain using a method described and visualized in detail in the publications of Mathis et al. (2011)23 and Yuanxiang et al. (2014)24. Cool the brain down to 2-4 °C in an ice-cold slicing buffer (for at least 2 min) before dissecting the cerebellum and separating the hemispheres. Use a cold surgical blade to dissect a piece of the dorsal cortex at a 70° angle along the dorsal edge of each hemisphere25 to get transverse slices from the ventral and the intermediate part of the hippocampus, as shown in Figure 1C and E.
With a cold dental cement spatula, transfer a hemisphere to a piece of filter paper to briefly dry the created surface (1-2 s). 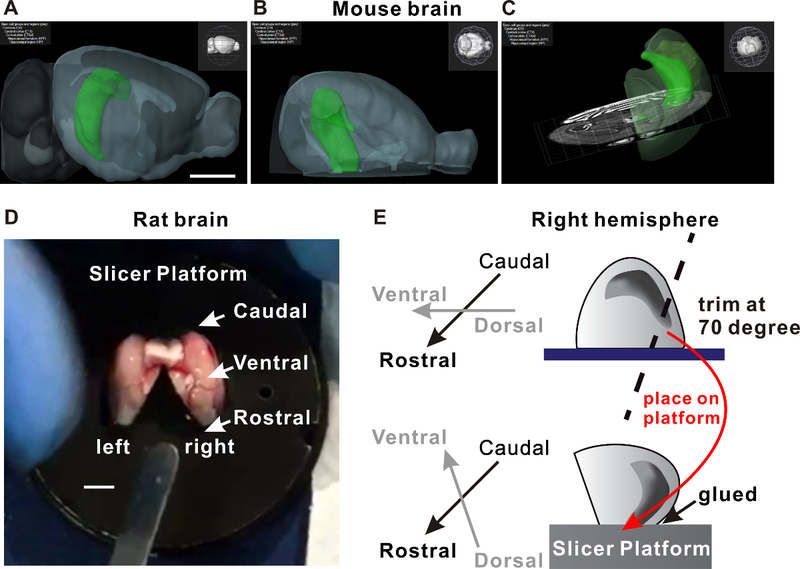 Mount the two hemispheres with freshly cut surfaces on the ice-cold slicing platform using fast-acting adhesive glue; have the caudal end of the hemispheres face the razor blade (Figure 1D). Place the slicing platform into the cooling chamber of a vibratome and fill that chamber with the slicing buffer (2-4 °C). Carbogenate using a perforated silicon tube. Cut 350 µm slices using adequate vibratome settings (e.g., blade forward speed: 1.2 mm/s, blade amplitude: 1 mm). Isolate the hippocampal formation from the subiculum and the entorhinal cortices using two injection cannulas (>28 G) as scissors. Remove the bubbles from the slice-holding mesh of the previously prepared incubation chamber using a Pasteur pipette. Transfer the slices that have some transparency at the stratum pyramidale from the slicing platform on the mesh of the incubation chamber. Avoid any folding, stretching, overlapping, and floating by aspirating aCSF and the slice into a large-mouth Pasteur pipette. NOTE: The whole procedure (step 2.5-2.14) can take 5-10 min; therefore, it is important to check the temperature of the buffer solution over time to maintain it at 4 °C. Incubate the slices at 30 °C for at least 1.5-2 h in the incubation chamber and provide carbogen at 4-6 L/h. NOTE: Adjust the flow rate of the carbogen to circulate the buffer in the incubator, but prevent the slices from floating. Add a 3-way tube connector to the outflow of the recycling system (Figure 2B). Connect the middle arm of the 3-way tube connector with a carbogen supply tube and regulate the flow rate with an airflow meter (3-4 L/h, Figure 2D and Figure 4C). Add a second 3-way tube connector to the inflow of the recycling system. Connect the middle arm to the tube facing the inline heater, the upper arm to a thin silicon tube (10 cm length), and the lower arm to the inflow tube from the reservoir (low-pass filter; Figure 4C). Place a tube squeezer on a thin silicon tube (OD: 2 mm) at a position along the tube where the pulsation of the aCSF in the slice chamber, generated by the peristaltic pump, is at its minimum. NOTE: The outflow-carbogenation (outflow-carb.) modification reduces the sensitivity of the carbogenation level to the volume of the aCSF reservoir, the aCSF recycling rate, and relative tube positions within small aCSF reservoirs (<50 mL; Figure 3). Regarding the low-pass filter, a certain amount of air in the thin silicon tube reduces the pulsation of the aCSF flow; thus, the tube should be filled mostly with air. Pre-warm the aCSF solution in a water bath to about 28-30 °C (this will prevent bubble formation in the recording chamber). Start the recycling system (4-5 mL/min) and activate the inline heater to equilibrate the system for at least 1 h.
Presoak a small piece of lens cleaning paper and a nylon mesh fixed on a U-shaped platinum wire in the submersion slice chamber for a few minutes (Figure 4). Remove the U-shaped platinum wire. Switch off the recycling and place a slice on the lens cleaning paper. Immediately place the slice-holding mesh on top of the slice, switch on the pump, and let the slice equilibrate for 30 min without dipping the objective into the aCSF. Fill the borosilicate micropipette (i.e., the recording electrode) with aCSF (tip resistance: 1-2 MΩ, filled 1/3 with aCSF) and mount it into the pipette holder. Check the insulation of the metal stimulation electrode by placing it into NaHCO3 solution (>40 mM). Connect the electrode to the negative pole of a DC voltage generator (1-2 V, positive pole: silver or platinum wire), and observe the formation of bubbles at the tip under a dissection microscope (>60x magnification). Place the tested epoxy-insulated tungsten stimulation electrode in the manipulator holder and the reference wires in the slice chamber. Add a second reference electrode to the chamber and connect it to the reference socket of the headstage of the recording electrode (Figure 4A). In the amplifier control software, click on the "zero clamp mode" box and proceed by double-clicking the "output gain list" box. Choose a gain of "100," double-click the "high pass filter list box (Bessel)," choose "0.1 Hz," and double-click the "low pass filter list box (AC)" to choose "3 kHz." In the recording software, click the on "Acquire | Open Protocol." Choose a protocol that has settings allowing for episodic stimulations and the digitalization of amplified potentials at 10-20 kHz for 50-100 ms and that automatically triggers a stimulus isolator 10 ms after the start of an episodic recording. Place the stimulation and recording electrodes in line and parallel to the stratum pyramidale, for example (Figure 4B and Figure 5). Click "Acquire | Edit Protocol" and choose the "trigger" tab (in the pop-up window). Click on the "trigger source" box and chose "space bar" as the trigger source. Click the "OK" button. Click the "record" button to start the acquisition and note the pop-up window with a trigger button. In the stimulus isolator software, click on the "voltage control" box and enter "0." Click the "download" button. Click on the "recording software" window and press the space bar. Repeat this cycle by sequentially entering values from 1 to 8, for example, at 1 mV steps in the "voltage control" box. Correlate the stimulation strength with fEPSP-slope values and determine the stimulation strength required to get 40% of the fEPSP-slope maximum. Click the "voltage control box" and enter the determined value. Click the "download" button. NOTE: A stimulus isolator is used to apply brief voltage or current pulses to brain tissue. The biphasic pulses can have 100 µs per phase. In the recording software, click the stop button and then the "Acquire" menu. Click on "Edit Protocol" and choose the "trigger" tab in the pop-up window. Click on the trigger source box and chose the "internal timer" as the trigger source. Click the "OK" button. Click the record button that starts the automatic recording of field potentials every 30 s, for example. Click the "stop" button after 30-60 min. Click on the "Acquire" menu, click on "Open Protocol," choose the desired induction protocol of synaptic plasticity, and click the "OK" button. Click the "record" button to automatically activate the high-frequency stimulation and recording. Click the "stop" button. NOTE: In case of studies relating to synaptic plasticity, apply one of the standard induction paradigms for long-term potentiation or long-term depression after prolonged baseline recording. Representative examples of the resulting modulation of the synaptic transmission are depicted in Figure 7 and Figure 8. In the recording software, click "Acquire | Open Protocol" and choose the same protocol as in step 4.12. Click the "OK" button and then click "record." Keep automatically running the field potential recordings for 2-4 h, for example. Click the "stop" button to terminate the recording. In case of pharmaceutical studies, apply the compound directly to the aCSF reservoir if permanent compound administration is desired (Figure 6). NOTE: See below for general tips. Clean the system weekly by recycling 10% H2O2 for no more than 20 min, followed by washing with deionized H2O. NOTE: Ethanol is not recommended for cleaning. It is likewise not recommended to immerse the reference wires and objective in H2O2. Remove precipitated salt on the surface of the objective lens or chamber surroundings with 0.1 N HCl and then water. Wash the carbogen bubbler in distilled water or 0.1 N HCl. Immerse the slice incubation chamber in 10% H2O2 for 5 min once a week and then thoroughly rinse the incubation chamber with deionized H2O. In case of metal stimulation electrodes, rinse the stimulating electrode tip with deionized water after each experiment and gently wipe the stimulating electrode tip with a cotton ball soaked with ethanol to remove residual tissue. Reduce the resistance of commercial metal stimulation electrodes by removing the insulation at the tip through a careful swipe with sandpaper. Reduce the loss of carbogen from the aCSF while recycling through the tubes by replacing the silicon tubes with polytetrafluoroethylene tubes. Keep the silver wires of the recording electrode and reference electrode in bleach for several days to form AgCl on the wire surface. In the protocol section, we described the preparation of acute hippocampal slices from the ventral and intermediate part of the hippocampal formation (Figure 1) of male C57BL/6 mice and male Wistar rats (5-8 weeks). The position of the hemispheres on the slicer platform helps to keep them stable and removes the need of stabilization with agar or agarose. The perfusion system itself is based on a peristaltic pump operated on high rotation to give the required flow rate of the liquid. Thus, the rapid aging of standard tubes within the pump created a substantial problem that we overcame by using non-silicon tubes (ID: 1.02 mm). The negative pressure for the outflow is also created by two parallel-connected tubes that have an inner diameter of 2.79 mm. These two tubes are connected to a cannula in the recording chamber to allow for the aspiration of the liquid (Figure 4A). The carbogenation rate of the aCSF in the reservoir must be stable over many hours, which can be difficult to achieve using ventilation stones or tubes with small pores. Since the outflow-carbogenation does not rely on small pores, the carbogen flow rate over time remains stable (Figure 2). If the experiments are conducted with a small aCSF reservoir, the outflow-carbogenation helps to achieve an equilibrium of the dissolved oxygen (Figure 3). In addition, it minimizes the variability of the oxygen level between the experiments based on an altered inflow/outflow tube position, the number of active pores at the carbogen bubble tubes, and the liquid recycling rate. The slice is placed on lens paper to allow some liquid exchange from below (Figure 4A). Since the slice chamber can be mounted on an upright microscope that is equipped with a 40X objective, the position of the electrodes can be well controlled (Figure 4B and Figure 5). This further reduces the variability of the experiments in day-to-day work. To determine the stimulation strength required for the baseline recording of field potential, the dependency of the field potential size upon the stimulation strength must be determined by recording the fEPSPs at different stimulation strengths (Figure 5). The measurement of the input-output characteristic creates some stress on the slice at higher stimulation strengths. Thus, another approach is to search for a stimulation strength that just evokes a positive population spike component in the fEPSP-decay (black arrows in Figure 5)26. After recording a stable baseline for at least 30 min, drug administration can begin. Here, we presented an example of the effects of an eEF2K inhibitor on synaptic transmission. Inhibition of the eEF2K promotes synaptic transmission (Figure 6A), an effect that was attenuated by the inhibition of p38 MAPK (Figure 6B)20. Activity-dependent synaptic plasticity can be induced by a variety of stimulation paradigms10. Here, we presented representative experiments of synaptic plasticity that are based on a continuous sequence of stimuli at 100 Hz and on repeated stimulations at 1 Hz over 15 min. The resulting modulation of the synaptic transmission has been depicted in Figure 7 and Figure 8. In addition, it is shown in Figure 7 and Figure 8 that the stabilization of the oxygen level of small buffer reservoirs by the outflow-carbogenation (white circles, relative oxygen level at 24-40 min in Figure 3) improved the LTP and LTD induction in comparison to experiments with reservoir-carbogenation only (gray circles, oxygen level at 7-24 min). 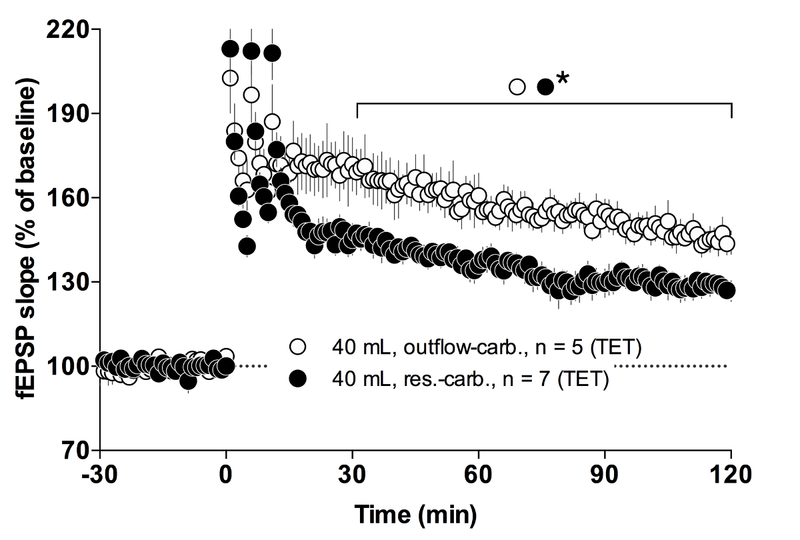 We did not test the combination of outflow-carbogenation and reservoir-carbogenation (7-24 min) because we were interested in creating an experimental system with lower and simpler carbogen use. The reservoir-carbogenation with no recycling (up to 7 min) represents the baseline level of oxygen in the aCSF reservoir. Figure 1: Positioning the brain hemispheres to obtain transverse slices of the hippocampus using a vibratome. (A) The hippocampal formation is indicated in a lateral view of the right hemisphere, in green, within a reconstructed mouse brain model. (B) A ventral view of the hippocampal formation. (C) The rostral-to-caudal view demonstrates a section of the ventral and intermediate part of the hippocampal formation for the right hemisphere at the horizontal plane. Since different regions along the septotemporal axis of the hippocampus have different degrees of innervation and function31,32, a different cutting angle is required for transverse slices of the dorsal hippocampus, for example. Scale bar = 3 mm (horizontal white lines). (D) The photo shows the hemispheres of a rat brain glued on a vibratome platform. Scale bar = 6 mm. (E) The sketch depicts the angle for trimming the dorsal edge of the cortex (upper schema) of the separated right hemisphere (dotted black line) and the rotation (red arrow) to glue the brain on the created surface on the slicing platform. Please click here to view a larger version of this figure. Figure 2: Elements of the carbogenation system for aCSF reservoirs below 50 mL. (A) Standard carbogenation systems using (a) perforated tubes as a carbogen bubble device; a tube was perforated by multiple punctures with a 250 µm-diameter stainless steel wire. (B) Outflow-carbogenation by (b) a 3-way tube connector (inner diameter: 2 mm) or (C) a vent unit that prevents liquid back flow with a hydrophobic filter. The middle arm of the 3-way tube connector is connected to a carbogen tank after a manometer (gas pressure: <1 atm) and a flow meter. The remaining arms are connected within the aCSF outflow tube. (D) The carbogen flow rate is controlled by flow meters. During the experiments, the aCSF reservoirs are kept at 28-30 °C. Please click here to view a larger version of this figure. Figure 3: The oxygen levels in 40 mL of aCSF at different conditions. The oxygen level during the reservoir-carbogenation (res.-carb.) and aCSF recycling decreased constantly (gray-filled circles, n = 3). However, the outflow-carbogenation (outflow-carb.) during aCSF recycling reduced the drop of the oxygen level, which reached equilibrium at baseline levels (white-filled circles, n = 3). Baseline levels were measured with res.-carb. without aCSF recycling. 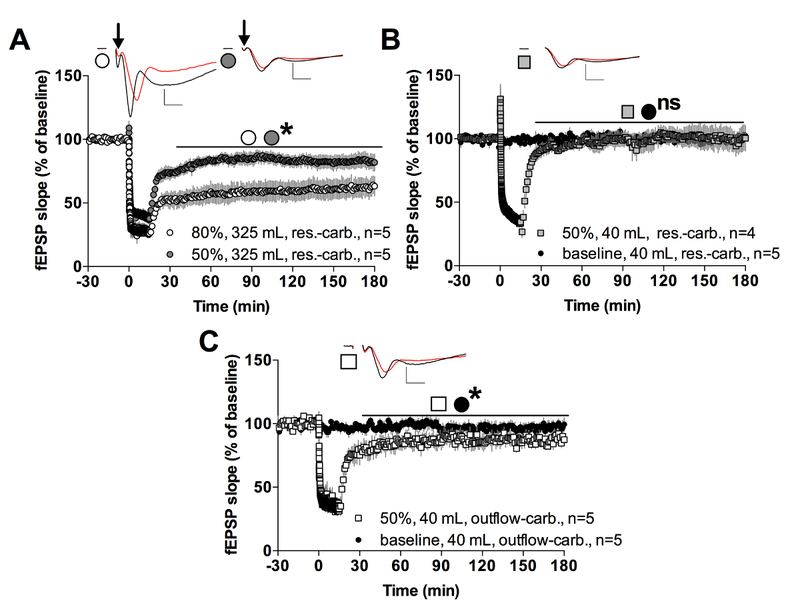 The vertical dotted gray lines indicate the switch to different carbogenation protocols. The effects of res.-carb with recycling (7-24 min) and outflow-carb. with recycling (white circles, 24-40 min) on the induction of LTP and LTD are depicted in Figure 7 and Figure 8. The data are presented as the mean ± SEM. Please click here to view a larger version of this figure. Figure 4: Components of outflow-carbogenation for experiments in a submersion slice chamber. (A) Presentation of the submersion slice chamber. The U-shaped platinum wire with the nylon fibers holding a hippocampal slice is depicted. The silver wires were wrapped around a small cannula, creating a coil to increase the area of the silver wire ending. The stimulation reference wire was placed in the outflow chamber, and the recording reference was in the main chamber. To keep the reference electrode potential stable at different liquid levels, the recording reference wire can be insulated by a plastic tube, leaving only the "underwater" part of the wire exposed to the buffer. (B) The bright-field image shows a representative acute hippocampal slice and the electrodes. CA1, CA3: Cornu Ammonis 1, 3; DG: dentate gyrus; sub: subiculum; EC: entorhinal cortex. (C) The schematic highlights the main components of the outflow-carbogenation, without an indication of flow meters for the carbogen and the peristaltic pump. A low-pass filter can be placed just in front of the inline heater to reduce the pulsation of the aCSF flow. Please click here to view a larger version of this figure. Figure 5: Dependency of field potential shape upon stimulation strength and the position of the electrodes. (A) Representative examples of field potentials, evoked at different distances from the stratum pyramidale (str. pyr. ), and stimulation strengths are depicted. The horizontal black arrows indicate the positive source component of the population spike in the field potential decay. The positive source component of the population spike remained approximately at the middle of the initial fEPSP-rise phase at all tested "in-line" electrode positions, except the one very close to the cell body layer (e). (B) The position of the positive source component of the population spike varied greatly due to the misalignment of the stimulation and recording electrodes. Lac. : stratum lacunosum moleculare; Rad. : stratum radiatum; Pyr. : stratum pyramidale; Rec. : recording electrode; Stim. : stimulation electrode. Scale bar = 100 µm. Please click here to view a larger version of this figure. Figure 6: Representative example of the effects of an eEF2K inhibitor on hippocampal synaptic transmission using the outflow-carbogenation, with the recycling of a small aCSF reservoir20. After recording fEPSPs at 1 min intervals for 20 min, the eEF2K inhibitor A-484954 was added directly to the aCSF reservoir (horizontal line). A rapid increase of the synaptic transmission was detectable (white-filled circles). If the drug was not applied, the fEPSP-slope remained stable over the time of the recording (gray-filled circles). (B) Application of the p38 MAPK inhibitor (gray horizontal line) prevented the eEF2K inhibito- induced enhancement of field potentials. The data are presented as the mean ± SEM. Please click here to view a larger version of this figure. Figure 7: Representative recordings of activity-dependent potentiation of synaptic transmission using outflow-carbogenation (outflow-carb. ; white circles) and reservoir-carbogenation (res.-carb. ; black circles), with the recycling of a small aCSF reservoir. The potentiation was induced after time point 0 by three times 100 Hz/s trains (Tet. : tetanization, high-frequency stimulation). The data are presented as the mean ± SEM. Bracket: statistical comparison of groups per time point; unpaired T-test, not assuming consistent standard deviation. *p <0.05. Please click here to view a larger version of this figure. Figure 8: Dependency of activity-dependent depression of synaptic transmission upon stimulation strength and carbogenation. (A) Using reservoir-carbogenation (res.-carb.) with the recycling of a large aCSF volume, a 1 Hz stimulation for 15 min at 80% of maximal fEPSP-slope evoked a strong depression of synaptic transmission (white circles). 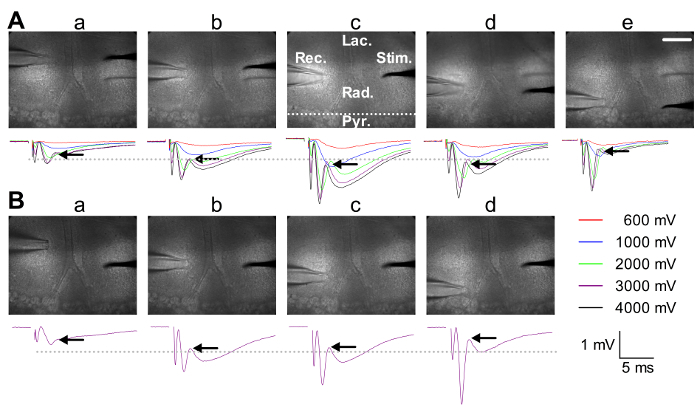 However, as the representative fEPSP traces before (black trace) and after (red trace at the 110th min) LTD induction indicate, the presynaptic fiber volley (vertical black arrow) was greatly reduced. This is an example indicating that electrochemical processes at the stimulation electrode could harm the afferents, causing a depression that does not rely partially on LTD-related mechanisms. Reducing the stimulation strength to 50% of the fEPSP-slope maximum induced a depression of synaptic transmission to a lower degree, but without changing the presynaptic fiber volley (gray-filled circles). (B) LTD induction did not evoke a lasting depression of fEPSP-slopes in the experiments with the reservoir-carbogenation and the recycling of a small aCSF reservoir (res.-carb. ; gray-filled squares). 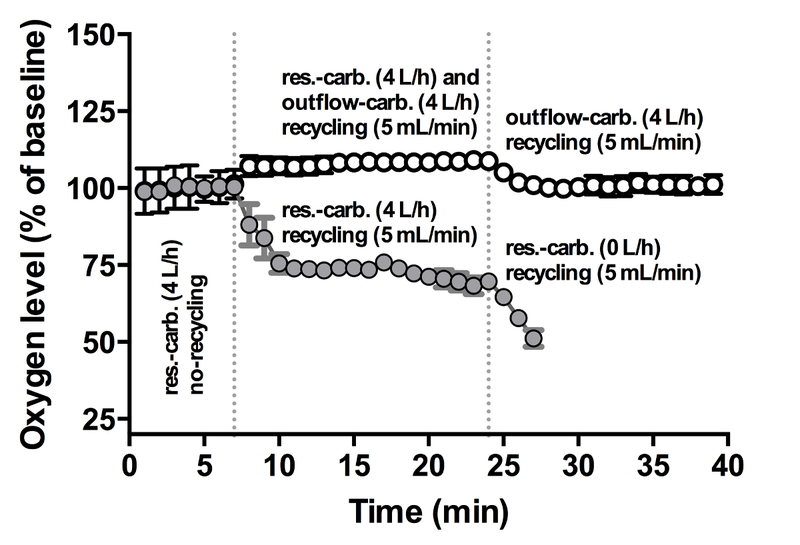 (C) The outflow-carbogenation with recycling of a small aCSF reservoir improved the outcome of the LTD induction. The inserts present representative fEPSPs before (black traces) and after (110th min, red traces) LTD induction. For the representative fEPSPs, the vertical scale bars indicate 1 mV, and the horizontal scale bars correspond to 2 ms. The data were obtained from acute hippocampal slices (350 µm) of 1 to 2 month old C57/BL 6 mice and are presented as the mean ± SEM. Brackets: statistical comparison of groups per time point; unpaired T-test, not assuming consistent standard deviation. *p <0.05, ns: non-significant. Please click here to view a larger version of this figure. Although interface slice chambers exhibit more robust synaptic responses25,26,27,28, submersion chambers provide additional convenience for patch-clamp recording and fluorescence imaging. Thus, we have described several aspects of field potential recordings in acute hippocampal slices using a commercial submersion slice chamber that can easily be extended to the imaging of fluorescence probes in neurons17,18,19. Besides the slice preparation25, the maintenance of a constant carbogen level in the recording chamber after many hours represents one of the obstacles. Since the carbogen level is only controllable by the initial saturation of the aCSF reservoir, differences in the oxygen level in the aCSF are easily obtained in day-to-day experiments. Thus, an oxygen meter is recommended to speed up the troubleshooting and to adjust the conditions (e.g., temperature, carbogen flow rate, carbogenation tools, and aCSF recycling rate) to reach at least 28 mg/L oxygen in the aCSF reservoir at stable levels. In addition, the common practice to change the size of the aCSF container for drug application can induce effects on field potentials due to differences in their carbogen levels. The use of the outflow-carbogenation of a small recycling buffer volume improved the outcome of the synaptic plasticity experiments. Improved dissolving of oxygen in the liquid is based on the larger ratio between the contact area of the liquid and carbogen. In addition, the outflow-carbogenation reduces the supply of the carbogen-depleted aCSF in the aCSF reservoir. The stability of the carbogenation might be further improved by a specifically designed venturi based on the principle of commercial products29. Even with the best slice preparation and setup conditions, it is often unavoidable that field potentials cannot be induced when insulated metal stimulation electrodes are used. Often, the reason is that the insulation has been damaged due to bending or cleaning. As we have indicated in the methods, a simple approach is to check the bubble formation at low DC-voltage. In addition, this step helps to clean the tip and to reduce the impedance of the stimulation electrode. The use of glass pipettes for stimulation is common and has the advantage of providing a narrower field of fiber stimulation. Often, it is not possible to find a maximal fEPSP slope when glass pipette stimulation is used. The appearance of the positive source component of the population spike in the fEPSP-decay phase might then be used to adjust the stimulation strength23. May publication regarding the induction of activity-dependent synaptic plasticity and the involvement of different signaling pathways dependent upon the applied induction protocol are available10. However, from the methodological point of view, the high-frequency stimulation might cause distinct artifacts that could prevent the successful induction of synaptic plasticity. A repeated 100 Hz/1 s stimulation could cause polarization of the stimulation electrodes or electrochemical reactions30, resulting in the depression of synaptic transmission due to damage to the afferents (see Figure 8 for an example). To minimize the electrochemical processes, the use of biphasic stimulation pulses and a stimulation power not more than 2 V for baseline recordings are recommended. 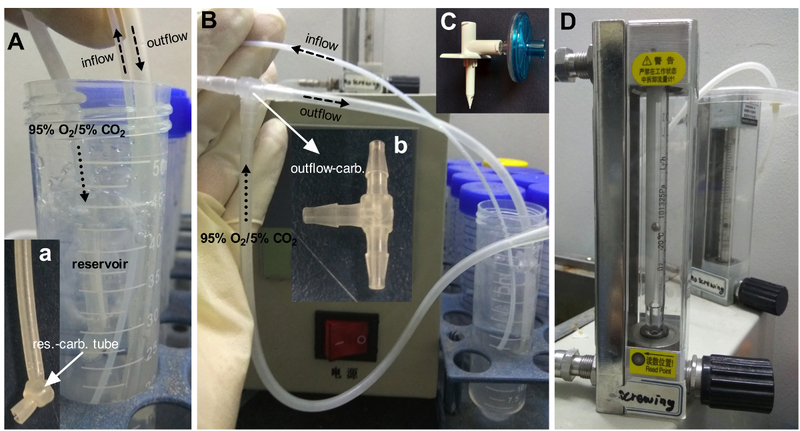 In summary, outflow-carbogenation helps to stabilize the oxygen level in experiments that rely on the recycling of a small buffer reservoir, enhancing the cost-efficiency of drug experiments. W.W. conducted, analyzed, and designed the experiments and wrote the manuscript. D.X. and C.P. assisted in figure preparation and conducted the experiments. This work was supported by NSFC (31320103906) and 111 Project (B16013) to T.B. McIlwain, H. Metabolic response in vitro to electrical stimulation of sections of mammalian brain. Biochem J. 48, (4), (1951). McIlwain, H., Richards, C. D., Somerville, A. R. Responses in vitro from the piriform cortex of the rat, and their susceptibility to centrally-acting drugs. J Neurochem. 14, (9), 937-938 (1967). Yamamoto, C., McIlwain, H. Electrical activities in thin sections from the mammalian brain maintained in chemically-defined media in vitro. J Neurochem. 13, (12), 1333-1343 (1966). Andersen, P., Bliss, T. V., Lomo, T., Olsen, L. I., Skrede, K. K. Lamellar organization of hippocampal excitatory pathways. Acta Physiol Scand. 76, (1), 4-5 (1969). Skrede, K. K., Westgaard, R. H. The transverse hippocampal slice: a well-defined cortical structure maintained in vitro. Brain Res. 35, (2), 589-593 (1971). Kirov, S. A., Sorra, K. E., Harris, K. M. Slices have more synapses than perfusion-fixed hippocampus from both young and mature rats. J Neurosci. 19, (8), 2876-2886 (1999). Schwartzkroin, P. A. Characteristics of CA1 neurons recorded intracellularly in the hippocampal in vitro slice preparation. Brain Res. 85, (3), 423-436 (1975). Schwartzkroin, P. A., Wester, K. Long-lasting facilitation of a synaptic potential following tetanization in the in vitro hippocampal slice. Brain Res. 89, (1), 107-119 (1975). Reymann, K. G., Frey, J. U. The late maintenance of hippocampal LTP: requirements, phases, 'synaptic tagging', 'late-associativity' and implications. Neuropharm. 52, (1), 24-40 (2007). Bliss, T. V., Collingridge, G. L., Morris, R. G. Synaptic plasticity in health and disease: introduction and overview. Philos Trans R Soc Lond B Biol Sci. 369, (1633), 20130129 (2014). Bliss, T. V., Gardner-Medwin, A. R. Long-lasting potentiation of synaptic transmission in the dentate area of the unanaestetized rabbit following stimulation of the perforant path. J Physiol. 232, (2), 357-374 (1973). Reid, K. H., Edmonds, H. L., Schurr, A., Tseng, M. T., West, C. A. Pitfalls in the Use of Brain-Slices. Prog Neurobiol. 31, (1), 1-18 (1988). Rambani, K., Vukasinovic, J., Glezer, A., Potter, S. M. Culturing thick brain slices: an interstitial 3D microperfusion system for enhanced viability. J Neurosci Methods. 180, (2), 243-254 (2009). Hajos, N., et al. Maintaining network activity in submerged hippocampal slices: importance of oxygen supply. Eur J Neurosci. 29, (2), 319-327 (2009). Redondo, R. L., et al. Synaptic tagging and capture: differential role of distinct calcium/calmodulin kinases in protein synthesis-dependent long-term potentiation. J Neurosci. 30, (14), 4981-4989 (2010). Stopps, M., et al. Design and application of a novel brain slice system that permits independent electrophysiological recordings from multiple slices. J Neurosci Methods. 132, (2), 137-148 (2004). Behnisch, T., Matsushita, S., Knopfel, T. Imaging of gene expression during long-term potentiation. Neuroreport. 15, (13), 2039-2043 (2004). Karpova, A., et al. Encoding and transducing the synaptic or extrasynaptic origin of NMDA receptor signals to the nucleus. Cell. 152, (5), 1119-1133 (2013). Karpova, A., Mikhaylova, M., Thomas, U., Knopfel, T., Behnisch, T. Involvement of protein synthesis and degradation in long-term potentiation of Schaffer collateral CA1 synapses. J Neurosci. 26, (18), 4949-4955 (2006). Weng, W., Chen, Y., Wang, M., Zhuang, Y., Behnisch, T. Potentiation of Schaffer-Collateral CA1 Synaptic Transmission by eEF2K and p38 MAPK Mediated Mechanisms. Front Cell Neurosci. 10, (247), (2016). Meduna, L. J., Jackman, A. I. Carbon dioxide inhalation therapy. Res Publ Assoc Res Nerv Ment Dis. 31, 280-286 (1953). Edwards, F. A., Konnerth, A., Sakmann, B., Takahashi, T. A thin slice preparation for patch clamp recordings from neurones of the mammalian central nervous system. Pflugers Arch. 414, (5), 600-612 (1989). Mathis, D. M., Furman, J. L., Norris, C. M. Preparation of acute hippocampal slices from rats and transgenic mice for the study of synaptic alterations during aging and amyloid pathology. J Vis Exp. (49), (2011). Yuanxiang, P., Bera, S., Karpova, A., Kreutz, M. R., Mikhaylova, M. Isolation of CA1 nuclear enriched fractions from hippocampal slices to study activity-dependent nuclear import of synapto-nuclear messenger proteins. J Vis Exp. (90), e51310 (2014). Leutgeb, J. K., Frey, J. U., Behnisch, T. LTP in cultured hippocampal-entorhinal cortex slices from young adult (P25-30) rats. J Neurosci Meth. 130, (1), 19-32 (2003). Kloosterman, F., Peloquin, P., Leung, L. S. Apical and basal orthodromic population spikes in hippocampal CA1 in vivo show different origins and patterns of propagation. J Neurophysiol. 86, (5), 2435-2444 (2001). Thiemann, W., Malisch, R., Reymann, K. G. A new microcirculation chamber for inexpensive long-term investigations of nervous tissue in vitro. Brain Res Bull. 17, (1), 1-4 (1986). Shetty, M. S., et al. Investigation of Synaptic Tagging/Capture and Cross-capture using Acute Hippocampal Slices from Rodents. J Vis Exp. (103), (2015). Du, H., Lin, J., Zuercher, C. Higher efficiency of CO2 injection into seawater by a venturi than a conventional diffuser system. Bioresour Technol. 107, 131-134 (2012). Weinman, J., Mahler, J. An Analysis of Electrical Properties of Metal Electrodes. Med Electron Biol Eng. 2, 299-310 (1964). Fanselow, M. S., Dong, H. W. Are the dorsal and ventral hippocampus functionally distinct structures. Neuron. 65, (1), 7-19 (2010). Wang, M., et al. Translation of BDNF-gene transcripts with short 3' UTR in hippocampal CA1 neurons improves memory formation and enhances synaptic plasticity-relevant signaling pathways. Neurobiol Learn Mem. (2016).